Anyway, I wanted pie sans gooey stuff. So, I hit the internet. I was able to find pie crust cookies. 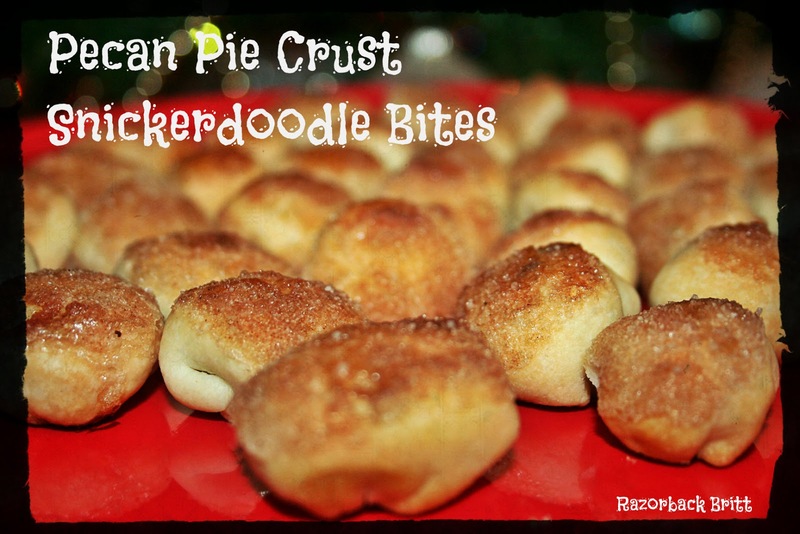 But those were just pie crust sprinkled with cinnamon sugar. Eh. Not enough. I also found mini pecan pie tarts that are basically pecan pie without the goop. Well, honestly, who has those little mini tart pans? I sure don’t! So, I made my own creation! Taking inspiration from Cookies and Cups, I made some snickerdoodly pie crust balls with ingredients in the middle (she loves stuffed cookies…see cream cheese snickerdoodles, & white chocolate snickerdoodles). So I made stuffed pie bites. They were easy! I present to you: Pecan Pie Crust Snickerdoodles. 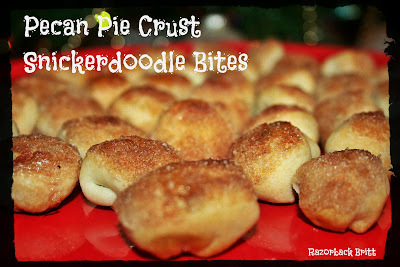 I am entering these Pecan Pie Crust Snickerdoodle Bites in the Creative Holiday Recipe Contest hosted by Confessions of a Cookbook Queen and Cookies and Cups! 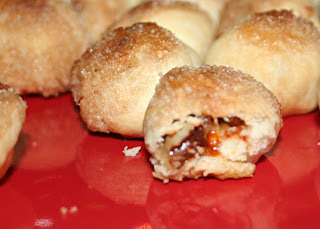 Next, I stuffed them with pecans and other goodies. About 3-4 pieces of pecans, a couple cinnamon chips and a couple white chocolate chips. Then you fold it all up. First, fold it like a taco. Then fold in the other sides. Then close it into a little ball. Bake at 415 for 12-15 minutes (and then I broiled mine on low for like 2 minutes to brown) and eat. The inside is pecan-pie-ish…the outside is crust…with a hint of sweetness. They are perfection. Pecan pie taste with no goop. Excuse the post-workout look. They were so good, I just couldn’t wait on them. I took this batch to a potluck at work and they were attacked by my coworkers! Hope you enjoy them too! Oh wow! These are totally genius! I am of the firm belief you can never have too much crust…well…ok, that was weird. But anyway, these are amazing! Thanks so much for entering! Looks good! My boyfriend is a pie purist (ie only big pies of normal traditional fillings) so I’ll have to shove them down his throat to get him to try them. But I’m sure, at first bite, he’ll be hooked. Seriously, I am imagining all the awesome possibilities these hold…and what I could dip them in. YUM!!! OOOH dip! What a good idea! Why didn’t I think of dipping these in something? Yum! Maybe a cream cheese caramel dip?